The National Rural Health Mission (NRHM), now under National Health Mission is an initiative undertaken by the government of India to address the health needs of under-served rural areas. Launched in April 2005 by Indian Prime Minister Manmohan Singh, the NRHM was initially tasked with addressing the health needs of 18 states that had been identified as having weak public health indicators. The Union Cabinet headed by Dr.Manmohan Singh vide its decision dated 1 May 2013, has approved the launch of National Urban Health Mission (NUHM) as a Sub-mission of an overarching National Health Mission (NHM), with National Rural Health Mission (NRHM) being the other Sub-mission of National Health Mission. #State Consultant: MBBS/ Dental/ Ayush/ Nursing Graduate or Masters in Hospital (or Health) Administration/ Hospital (or Health) Management (MHA or equivalent) with 4-5 years experience in relevant field. 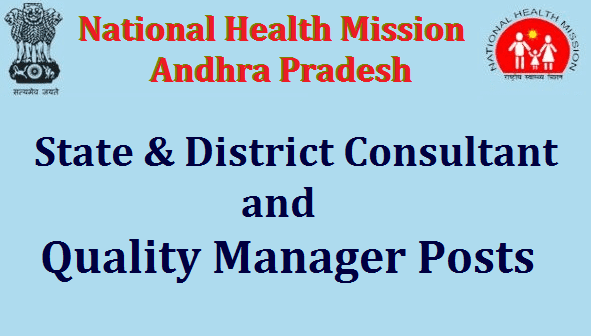 #District Consultant/ District Hospital Quality Manager: MBBS/ Dental/ Ayush/ Nursing/ Life Science/ Social Science Graduate and/or Masters in Hospital (or Health) Administration/ Hospital (or Health) Management (MHA or equivalent) with 2 years experience in relevant field. Monthly salary as per 2016-17 Rop Rs.50,000/- per month for State Consultant and Rs.40,000/- per month for District Consultant and District Hospital Quality Manger. Eligible candidates can download prescribed application form from cfw.ap.nic.in and send along with attested copies of all relevant certificates to the following address so as to reach on or before 30.05.2017. Saipuram Colony, One Center, Gollapudi, Vijayawada Rural, Krishna District, Andhra Pradesh. Selection will be made through Interview. Weightage of marks applicable in the following ratio.The selection is on contract basis a period of one year and contract may be extended, depending on performance. #Interview Presentation Skill - 50 marks.